Each year, Mainers look forward to winter so they can break out their snowmobiles, sleds, snowboards, snowshoes and cross country skis! Tomhegan is a hub of winter activities, with snowshoeing trails, the lake for cross country skiing, Squaw mountain for downhill skiing and snowboarding and a few perfect sledding hills. 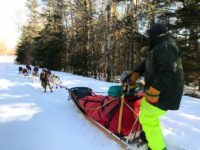 However, if you are interested in taking on some popular local cross country ski trails, Moosehead Lake has got you covered! Lily Bay State Park in Greenville, Maine has about two miles of trails that run beside Moosehead Lake, offering incredible views and the chance of seeing abundant wildlife, especially white-tailed deer. State Park fee information can be found here. Squaw Mountain Resort has a wonderful 5 mile groomed cross country trail loop at the foot of the mountain. There is a donation box at the trailhead to help maintain this incredible winter recreation area. After your adventure, head to the Lodge, open Friday-Sunday and school holidays and sip a warm hot chocolate or indulge in a delicious lunch! NREC, the Natural Recreation Education Center at Moosehead has about three and a half miles of interconnecting trails that can be accessed from the parking lot at the Moosehead Lake Visitors Center. Although conditions may vary, the trail network is made up of small loops that are groomed on a regular basis. You can learn more on Facebook on both the NREC page and Greenville Cross-Country Ski page. The Birches Resort has over forty miles of marked and groomed trails, ranging in difficulty from novice to high intermediate. Private lessons and rentals are also available there. The daily rate for these trails is a little pricier than the others, yet skiers have access to a much larger area. Before heading back to camp, grab a warm lunch or a beverage at the Birches restaurant or bar. Also, full day use rates include use of sauna and hot tub! No skis? No problem. Northwoods Outfitters in Greenville as well as The Birches Resort in Rockwood both offer equipment rentals. Remember both also offer lessons for beginners!